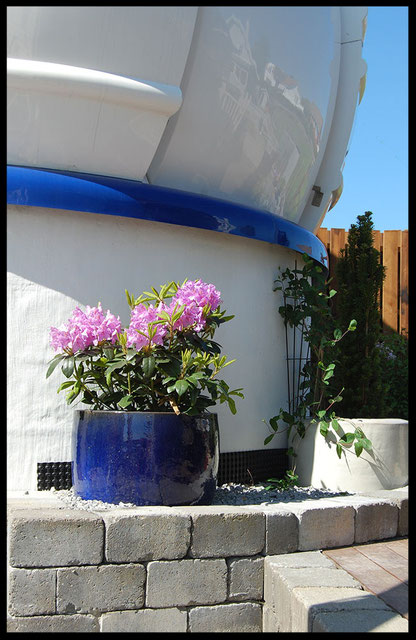 The four meter diameter observatory dome is produced by ScopeDome in Słupsk, northern Poland. The dome is architect-designed with the aim of achieving maximum stiffness and strength. 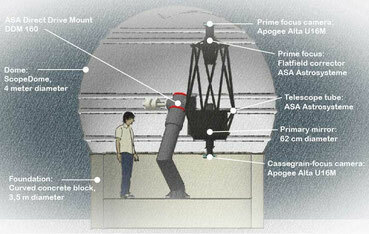 The rotational center of the RA and DEC-axes is lowered 20 cm below the dome's center of curvature. This is to prevent the shutter drive motor (located near the dome apex) from colliding with detectors and filter wheel mounted at prime focus. The shutter drive extends about 30 centimeters from the dome's interior surface. A ring of concrete blocks raises the terrain back to its original level. A ring of concrete blocks raises the terrain back to its original level. This places the entrance door below ground level. 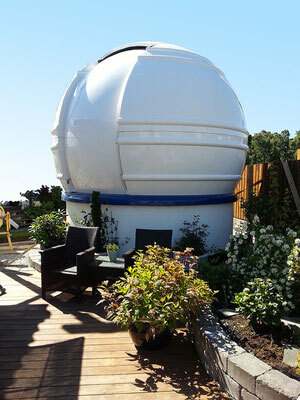 It also lowers the external height of the observatory to 3.6 meters, 40 centimeters below the maximum allowed height in municipal regulations. 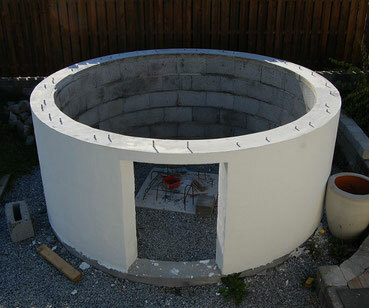 The foundation is built of curved Leca® blocks, made of fused clay aggregates, curved to an outside radius of 175 cm. The foundation is built of curved Leca® blocks, made of high-temperature fused clay spherules that form a strong, lightweight material similar to volcanic pumice. The interior and exterior is plastered to weatherproof the porous material. Looks like scaffolding? All large telescopes look like this. Two mirrors kept concentric along their optical axes by, of course, - triangles. 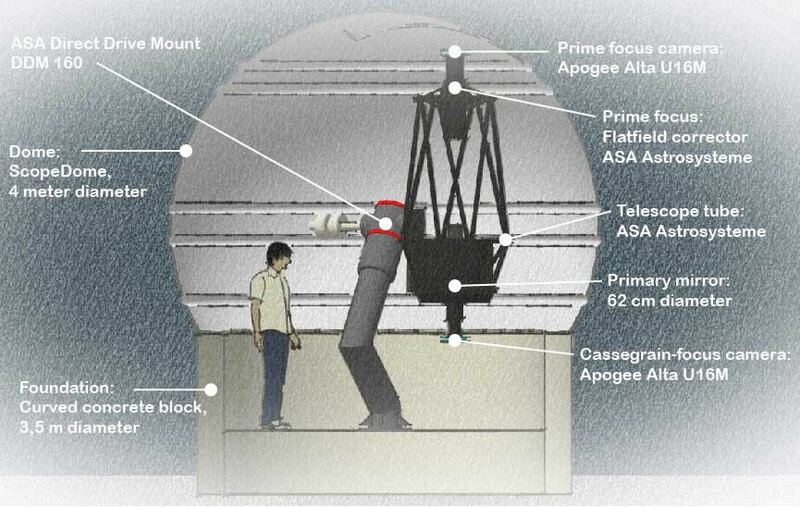 With a diameter of 62 centimeters, this will be the largest research grade optical telescope in Norway when it is completed in the autumn of 2017. Williams is grinding and figuring the 62 cm parabolic primary and 20 cm hyperbolic secondary mirror. 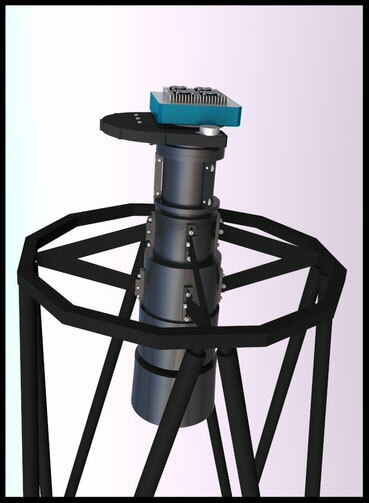 The German equatorial mount (DDM160) and truss tube assembly with prime focus flat-field corrector optics, is made by Astrosysteme Austria (ASA) near Freistadt, Austria. In order to access the primary focus, the secondary mirror is removable. An Apogee U16M camera and filter wheel is mounted on a flat field corrector. The primary mirror cage is constructed of powder-coated square steel. The trusses between the cage and secondary assembly are carbon fiber. The secondary mirror assembly is CNC-machined anodized aluminium, and supports both the secondary mirror and flat-field corrector optics. The optical design is classical Cassegrain. 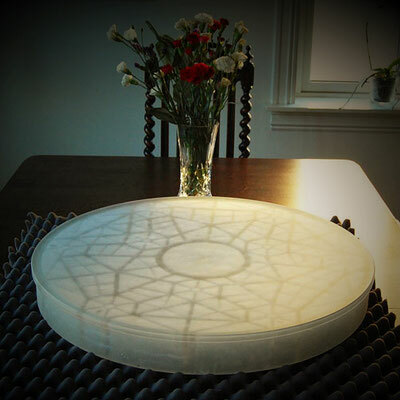 The optics consist of a 62 cm diameter parabolic primary mirror and a 20 cm diameter, hyperbolic secondary. In addition to the f10.4 Cassegrain focus, cameras may also be mounted at the f3.4 prime focus. The ASA field corrector produces a flat field covering the entire 1359 mm2 imaging area of a Kodak KAF-16803 CCD detector. To enable access to the f/3.4 prime focus, the secondary mirror is removable. The cylindrical housing to which the spider vanes are connected, contains the field corrector. The corrector produces a field over 60 mm in diameter. An Apogee U16M and filter wheel are mounted at the prime focus. The primary mirror blank is cast in Schott Borofloat glass by Dream Cellular. It is a lightweight blank with an engineered cellular design which maximizes stiffness and minimizes mass, weighing in at only 17 kg. 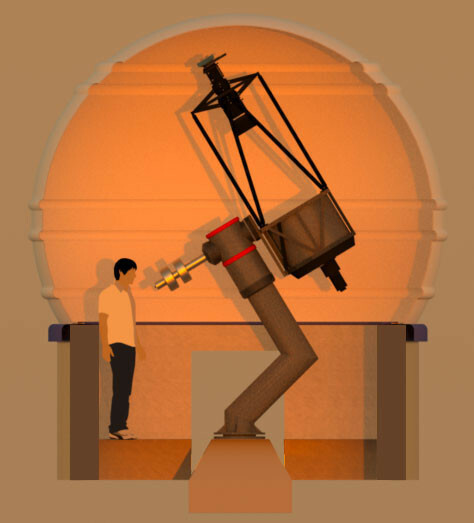 All large astronomical telescopes built after 1900 use mirrors instead of lenses to collect light. What's more, these enormous instruments are based on a 340 year old design called the Cassegrain. A concave mirror (the objective, or primary mirror) collects incoming starlight. A smaller convex mirror, the secondary mirror, extends the focal length and places the focal plane behind the primary mirror. The Cassegrain telescope is named after Laurent Cassegrain, who was born about 1629 near Chartres. He lectured in the natural sciences at the Collège de Chartres, which was a lycée, - a high school. The Cassegrainian optical concept was first published 25th April 1672 in the journal Recueil des mémoires et conférences concernant les arts et les sciences. Considering the success of Cassegrain's design, this publication was a landmark achievement. 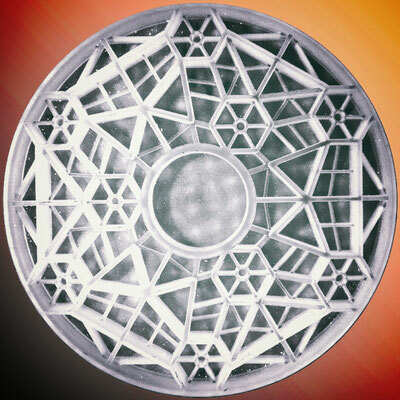 Cassegrain optics are used today for telescopes ranging from the Hubble Space Telescope to the largest ground-based observatories, as well as many commercial and home-made amateur instruments.